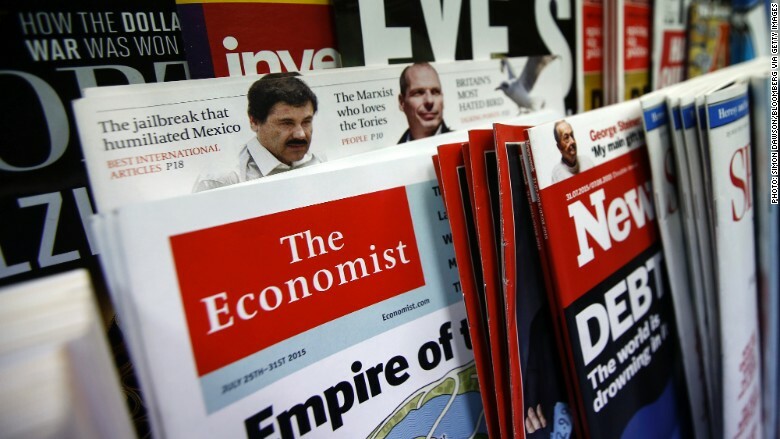 Pearson will offload its 50% stake in The Economist Group for £469 million ($731 million) as it continues to steer away from news and focus on education. Most of the shares will be sold to Exor, a European investment company controlled by Italy's billionaire Agnelli family. Exor will purchase 27.8% of its shares, raising its existing shareholding in The Economist Group from 4.7% to 43.4%. Pearson's (PSO) remaining stock will be repurchased by The Economist Group. The Group includes the business and current affairs weekly The Economist -- which has a circulation of around 1.6 million -- and other research operations. It follows Pearson's sale of the Financial Times Group last month, as the British firm seeks to concentrate on its primary business -- its educational textbook and publishing unit. Japanese publishing group Nikkei Inc. bought the iconic pink business newspaper and a range of other specialist titles for £844 million ($1.3 billion). "Pearson is now 100% focused on our global education strategy," the firm's chief executive John Fallon said in a statement Wednesday. The transaction is expected to close at the end of 2015.